Wilson, Dr. Thos. 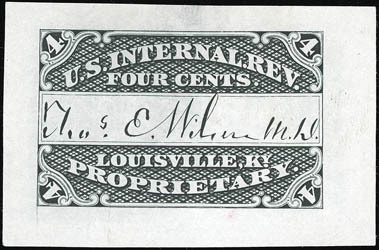 E., 4¢ black, large die proof, on India (54x35mm), bright and fresh, shallow thinning, otherwise Very Fine, a Very Rare Example of the Dr. Thomas. E., Wilson 4¢ Large Die Proof, With Approximately 6 Examples of this die proof known.